Today is Perfect Picture Book Friday. It is also the third stop on the blog tour of EDMUND PICKLE CHIN – A DONKEY RESCUE STORY, written by Clara Bowman-Jahn and Susan April Elwood. I’m honored that I get to review this wonderful brand-new picture book. Please make sure you scroll down to the end of the post – there are special prizes being offered if you visit and comment at all of the stops on the tour and you’ll also find a fun donkey craft for kids. When you can make a non-fiction book appealing to children, you have a winner! Talk about how people need to be responsible pet owners – what do animals need? How do different animals help us? How should work animals be treated? If you visit my blog often, you’ll know that I love to use paper plates as the base material in crafts for young children. You will need: 1 paper plate, construction paper, scissors, glue, markers or crayons. Color the plate gray or brown (depending on the crayon colors available or if desired, your child can paint it). Cut out the eyes, nose, hair, teeth and ears from construction paper and glue in place. Use the paper plate as a mask or puppet to role play parts of the story. 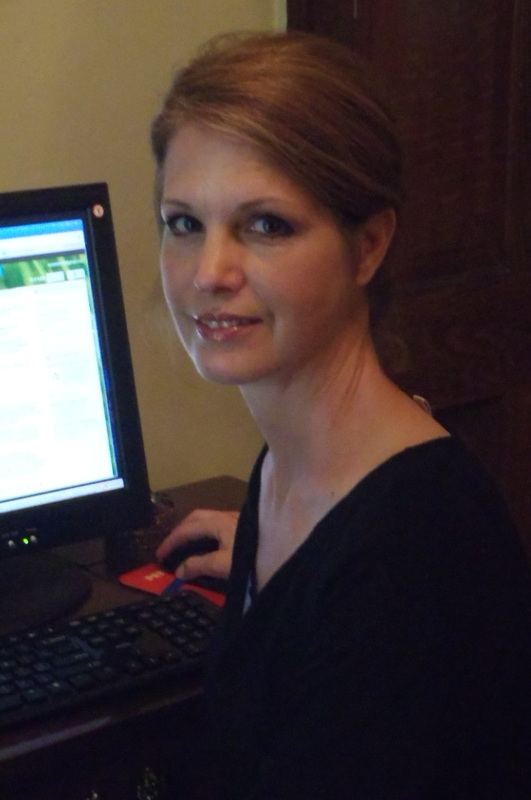 Clara Bowman-Jahn is one of the talented authors of Edmund Pickle Chin. Clara Bowman-Jahn worked as a registered nurse for thirty two years finally trading that job for her true love, writing. Clara’s short stories have been published in three anthologies, Campaigner Challenges 2011, The ‘I’ Word and Charms Vol. 2. She is also the author of Annie’s Special Day, a children’s picture book. Her second picture book is a true story, Edmund Pickle Chin, a Donkey Rescue Story. When Clara is not writing, she volunteers by teaching ESOL to adult students. She also likes Pilates, blogging, reading books and taking long walks with her husband. 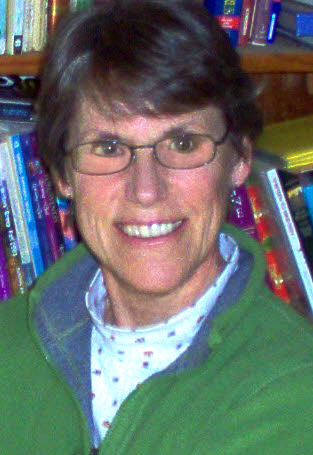 She is a member of the Society for Children’s Book Writers and Illustrators, Julie Hedlund’s 12×12 Picture Book Challenge, Susanna Leonard Hill’s Making Picture Book Magic, Pennwriters, Bethesda Writer’s Center and Round Hill Writer’s Group. She lives in rural Loudoun County, Virginia with her brilliant husband, and two cats. She is the proud mother of two wonderful grown sons and a grandmother to a delightful grandson. Susan April Elwood is the other talented author of Edmund Pickle Chin. Susan and her husband Tom moved from Northern Virginia in 2007 to central Georgia where they founded Evermay Farm, a non-profit rescue for farm animals. This is the setting for the book titled, Edmund Pickle Chin, A Donkey Rescue Story. 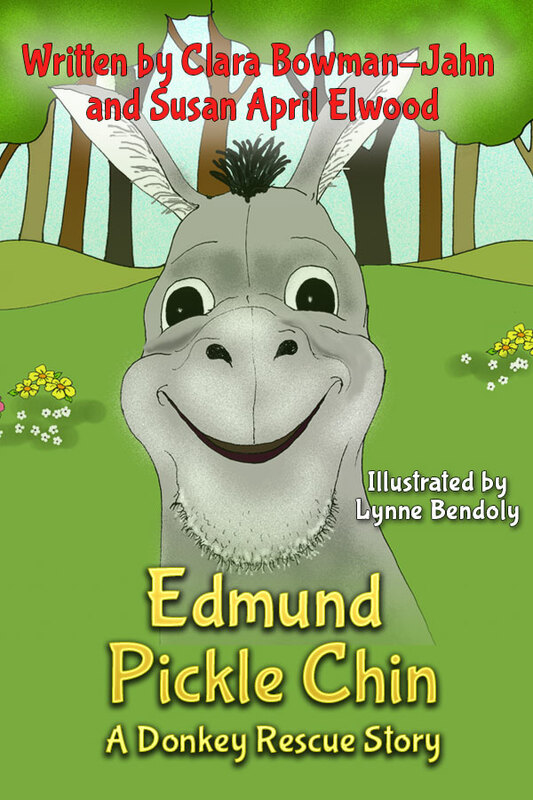 The story is based on Edmund, a donkey, the first of many animals to call Evermay Farm home. Susan and her husband Tom have two treasured sons, a wonderful daughter-in-law and a precious grandson. In her free time, Susan enjoys photographing animals and antiquing. Thanks so much for reading Friends! For all friends of Edmund are my friends. Below please find our links and the tour. Read every post, follow the blog and comment for prizes. The reader who follows each blog and comments on each stop of the tour will get first prize. And if there are many winners, hurray!! We will deliver! First prize is a print book of both Annie’s Special Day and Edmund Pickle Chin. Second prize is either a print copy of Edmund or of Annie…you get to pick! Finally, third prize is a copy of the ebook of Edmund Pickle Chin, a Donkey Rescue Story. Here are the links for the blog tour…don’t miss any of them!!!!! DON’T FORGET…VISIT EVERY STOP ON THE TOUR…LEAVE A COMMENT…FOLLOW THE BLOG…WIN A PRIZE! This entry was posted in Blog Tour and Giveaway, Edmund Pickle Chin - A Rescue Donkey Story, Perfect Picture Book Friday and tagged Clara Bowman-Jahn, Edmund Pickle Chin - A Donkey Rescue Story, Paper Plate Donkey Craft, picture book review, Susan April Elwood by viviankirkfield. Bookmark the permalink. I love a rescue story! This sounds adorable. I’m happy I’m not the only one to call my pet by a million different names…. Calling your pet by many names is not so bad, Genevieve…it’s worse when you call your kids by the dog’s name. 🙂 🙂 🙂 Glad you liked the book! Edmund Pickle Chin just sounds like a great story! I’m all for teaching kids about caring for animals. I do a lot of that when I go to school. Who knew there were so many fun crafts about donkeys?! Thanks for sharing! I thought you would love this book, Rhythm. 🙂 Glad you liked the donkey craft! Super review, Vivian. And I love your craft activities to go with it. Thank you, Joanna! And I absolutely LOVED your post…this is a very important book because it does such a great job of addressing animal abuse. Sounds like a wonderful experience come to life! What a neat story AND book. Thanks for sharing! And love those paper plate crafts! Great review about such an important story of rescue. I love true rescue stories that will help children understand how important it is to take care of animals. Good way to get kids involved in their communities. Edmund looks ornery. Fun donkey craft for kids. SUPER REVIEW, Clarike. I just knew Edmund would be a winner. Huge congrats, mate. Have pinned the review to Book Reviews (kids to YA) on my Pinterest Board. I love Edmund’s nickname! 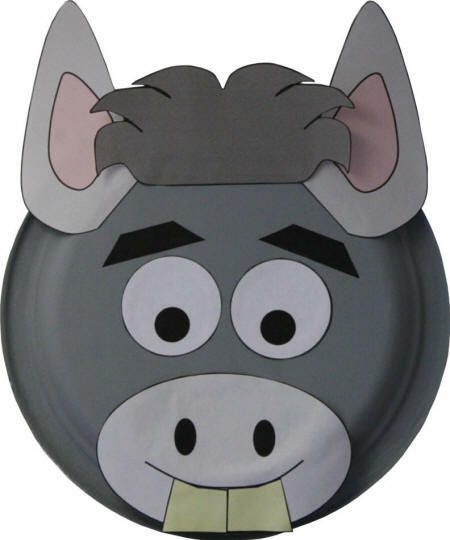 And that paper plate donkey is too cute! Thanks for adding this important book to the list, Erik! It’s so wonderful that Clar and Susan have highlighted this important issue while giving kids a delightful book to read. The paper plate donkey craft is adorable too! It is so important for kids to know about being kind to animals. Thanks for writing this book Clar and Susan! Right-o…let’s all trade…but then, I’m not sure I’d want to go through those difficult teen years again. Clar and Susan did a lovely job with the book…it was an important topic to tackle! I love the title and illustration style of this book! Thanks for sharing this at Booknificent Thursday! Looking forward to seeing you again this week! Love the paper plate Edmund face. Kids will have fun with that. All in all, a terrific book that highlights the need to rescue animals in need whenever possible. If children learn this early, they will probably be more responsible pet owners than earlier generations – and reading a wonderful story like Edmond Pickle Chin brings it home to them. YEA!! Thanks so very much, Suzy. I appreciate the reblog…and I know Clar and Susan do as well. 😉 Edmund is pretty awesome…and I loved that the book showed how he felt out of place at first…and then, by the end of the story, he is helping others feel more at ease…great lesson for young kids! Hurray for Edmund, Clar, Susan and Lynne! Love your review Vivian. I must have missed this one on the tour – I thought I had answered all of them. Love the paper plate face too. So much kid appeal here. Clarike has topped herself with this one. YEA! !